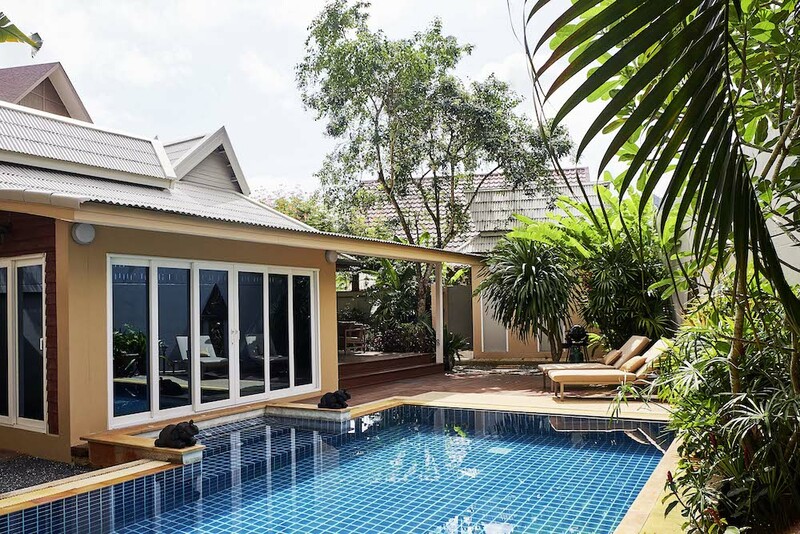 Baan PhuKhao Villa is located in the Klong Muang Beach area, the family friendly and upmarket resort area of Krabi, where most luxury resorts can be found, such as the Ritz-Carlton Phulay Bay, Dusit Thani and Sofitel. 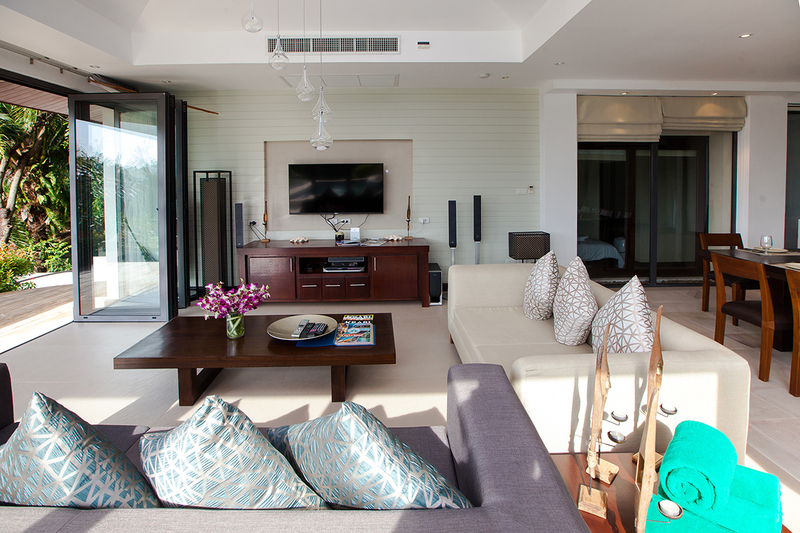 That Private Luxury Pool Villa is available as 2 bedrooms, ranging from 240 m2 of covered living space, with a private infinity pool with sea views. 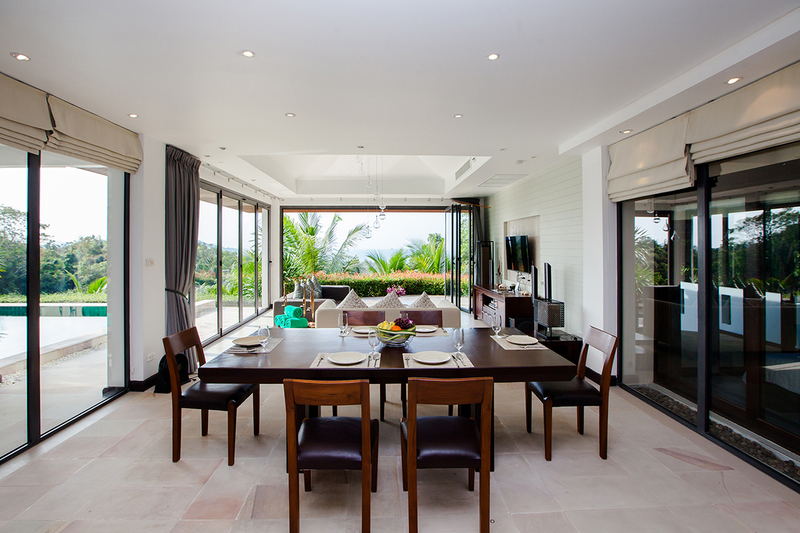 The Villa is one storey boasting a modern spacious design, offering an open plan living/entertainment area, dining area and kitchen area. 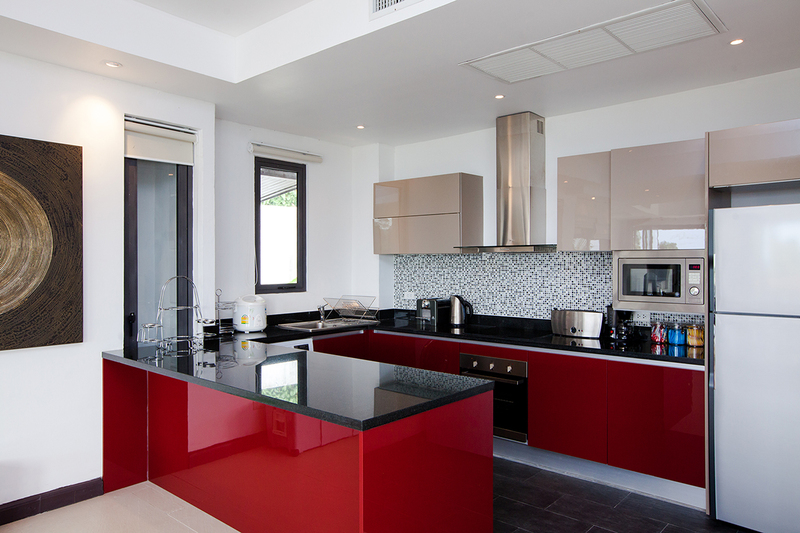 The kitchen is fully fitted and well equipped. 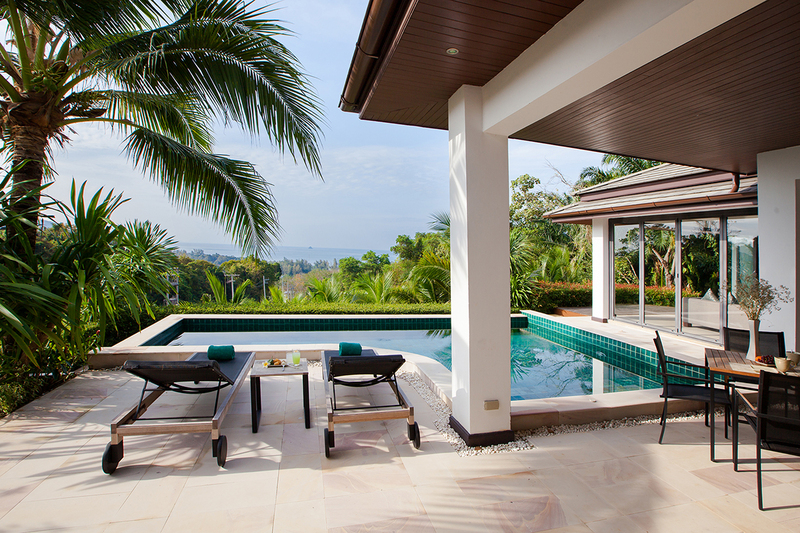 There is free Wi-Fi throughout the Villa. 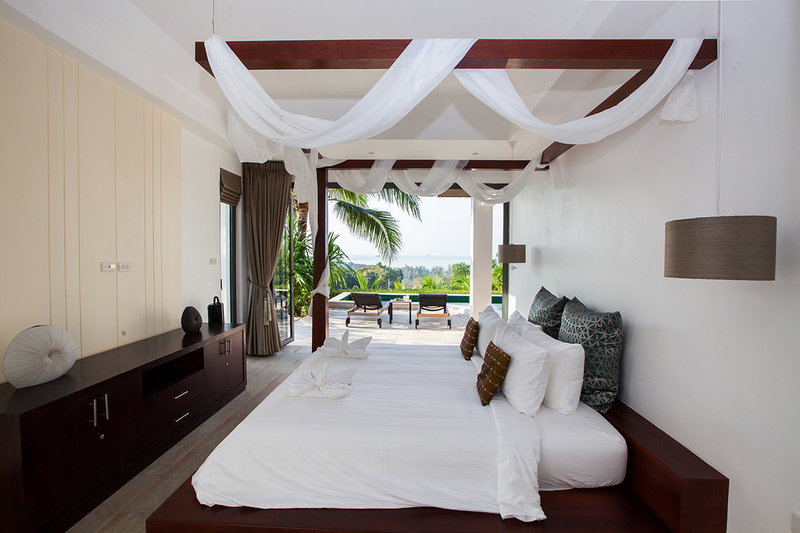 All bedrooms are comfortably decorated offering a selection of King-size and twin bed, all en-suite with luxury bathrooms. 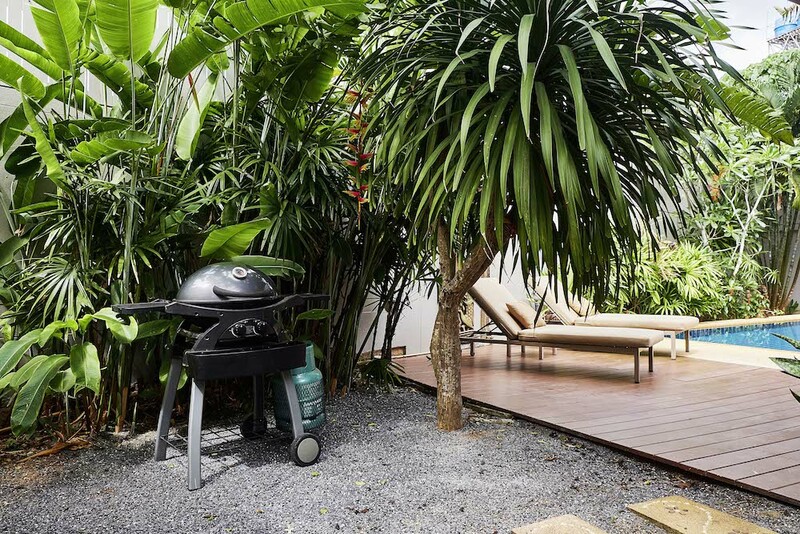 For style-conscious travelers, Baan Alessandra offers a hip, minimalist living space that maximizes natural light and focuses on outdoor relaxation. The clean modern lines of the villa and polished bare concrete walls contrast beautifully with the lush mountain landscape behind it; statement pieces of furniture in warm woods create a cosy interior. 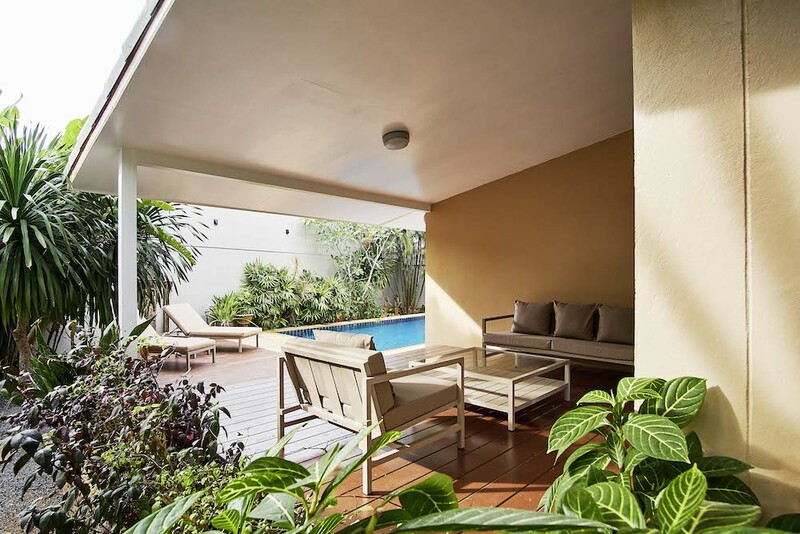 The streamlined floor plan is oriented around a covered patio that leads out to an open courtyard and pool deck. 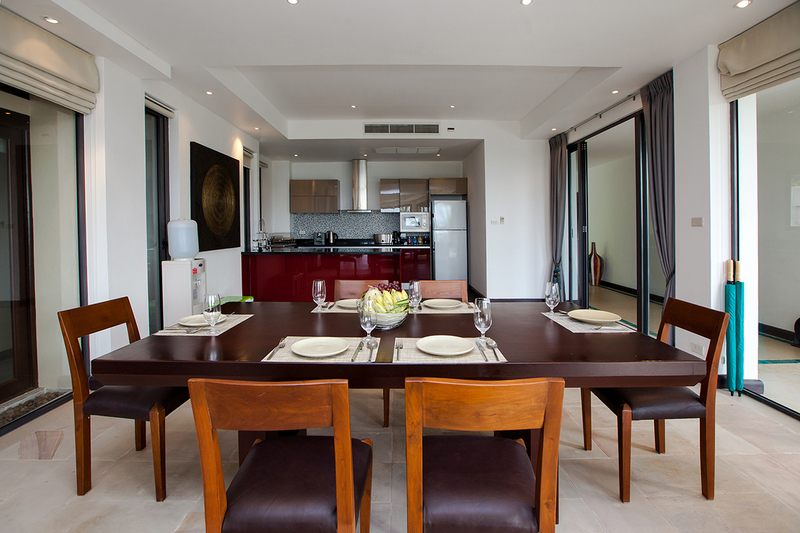 The open living area comprises a kitchen with built in units, and a central dining island in white granite; and a living room with 42” LCD TV and DVD player. 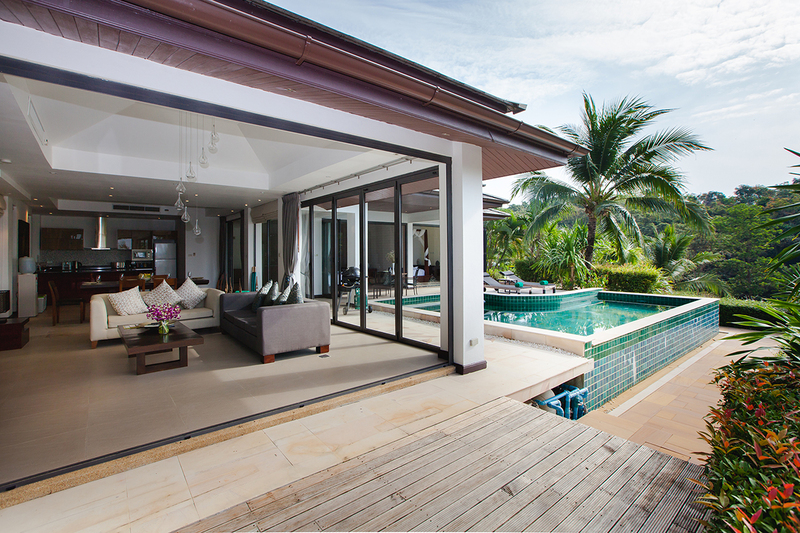 One wall is entirely glass; the doors may be opened to the patio, or can remain closed to benefit from air conditioning throughout. 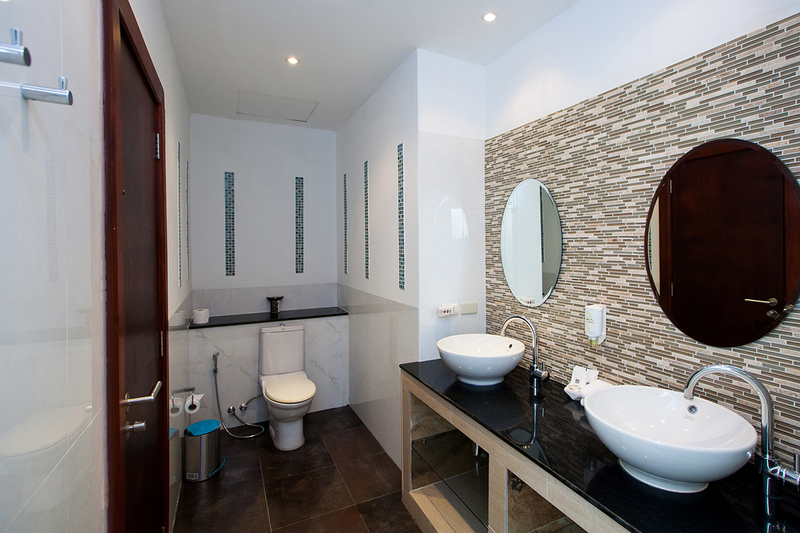 The living space also has its own powder room. 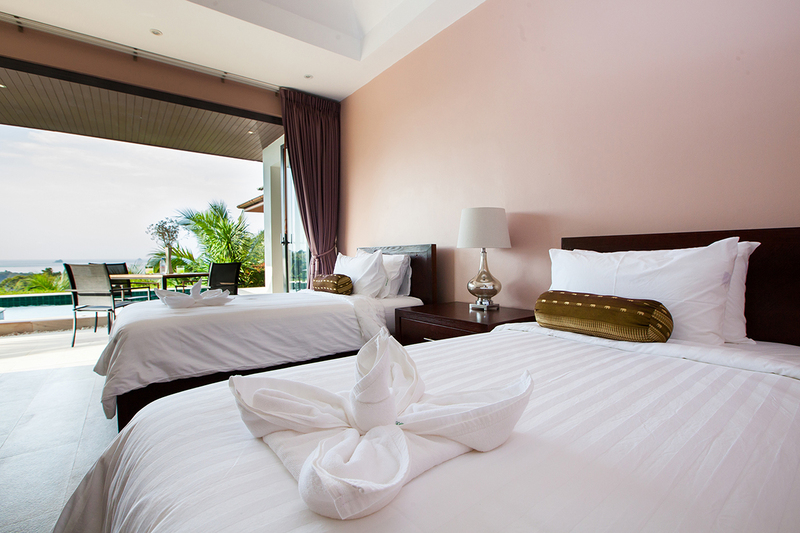 Two bedrooms – both with king size bed – are within the main house. 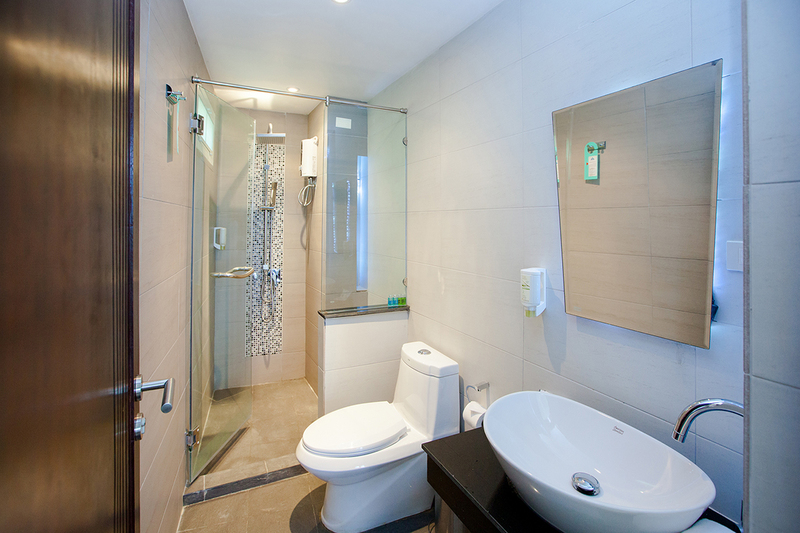 They share a modern en-suite bathroom. 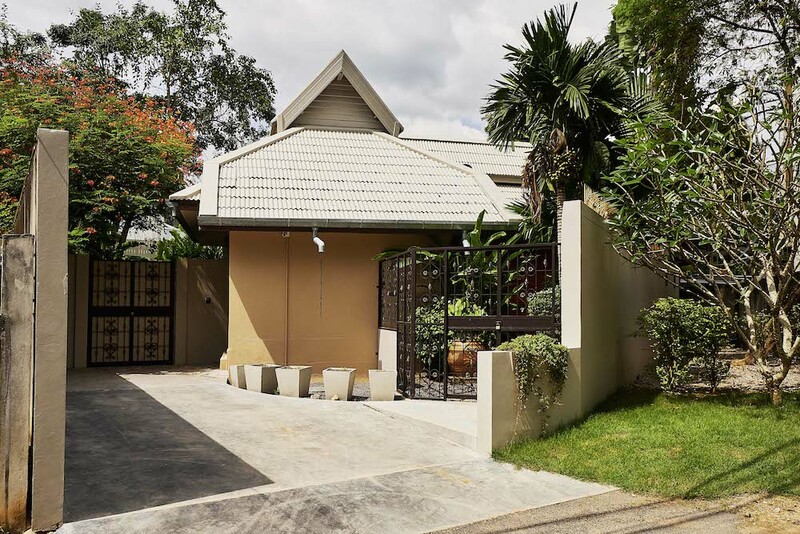 A third bedroom, also with king size bed, en-suite bathroom and kitchen sink, is located in its own building, right next to the main house – perfect for house guests, or extended family. 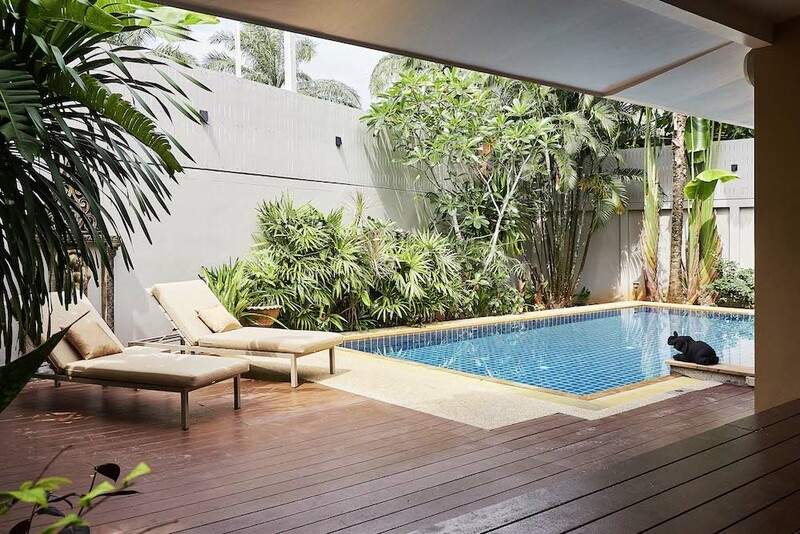 High ceilings, glossy tiled floors and a light colour palette help to keep the house cool; every room is also open to the garden, which creates breeze and also allows easy access to the outdoor dining area, with its magnificent teak table, as well as the 4 X 8 m private pool, which has an almost uniform depth of 120cm. 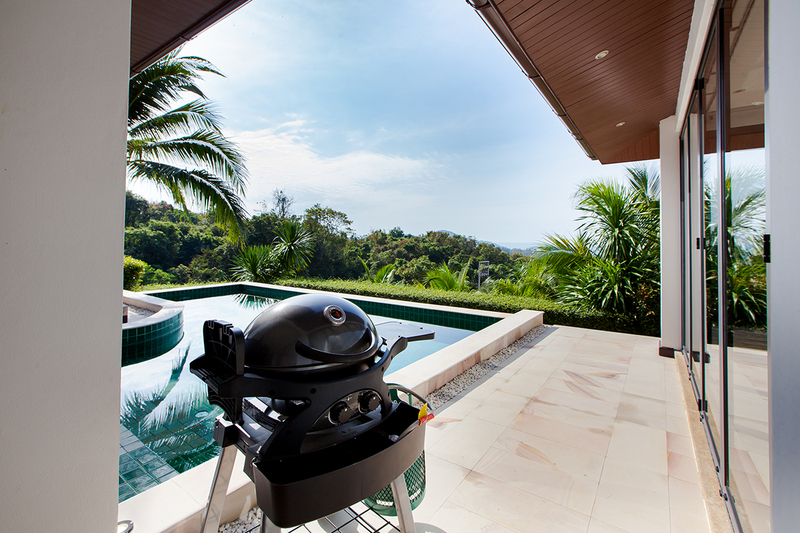 A high speed wireless internet connection is available throughout the property. 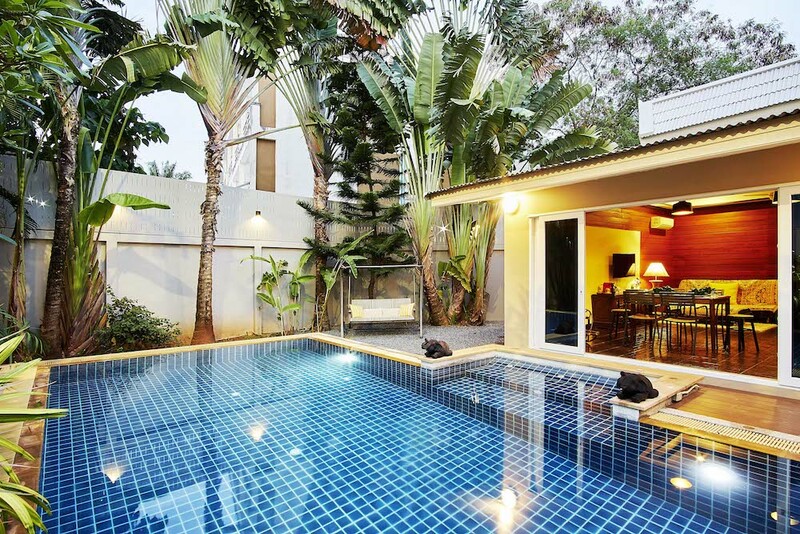 Baan Alessandra is located in a residential area in the village of Ban Nateen, famous for its batik and coconut shell handicrafts. 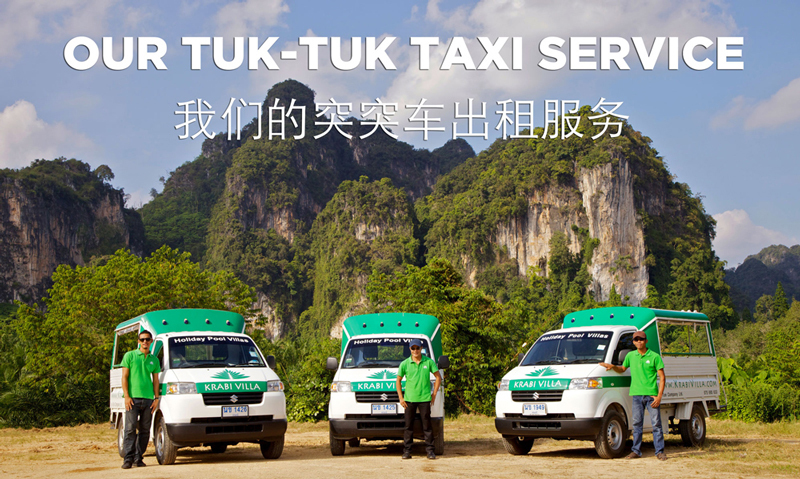 There are small convenience stores within walking distance; the beaches of Ao Nang and Nopparat Thara are 2.5 and 3km away respectively. 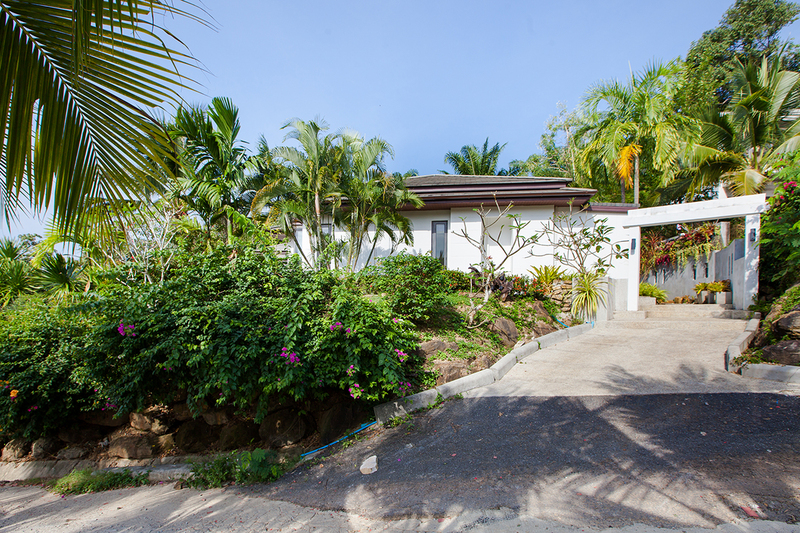 The villa has off-street parking; car or motorbike rental can be easily arranged. 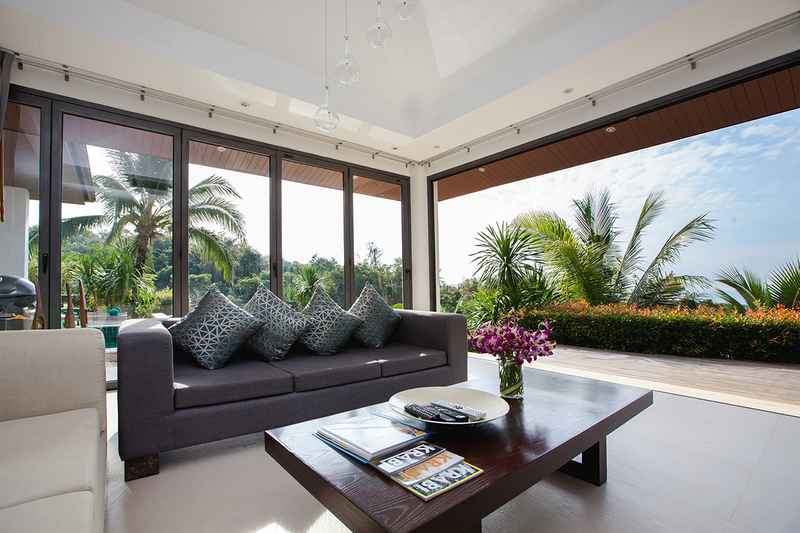 Baan Zoe is for discerning travellers in search of genuine luxury. 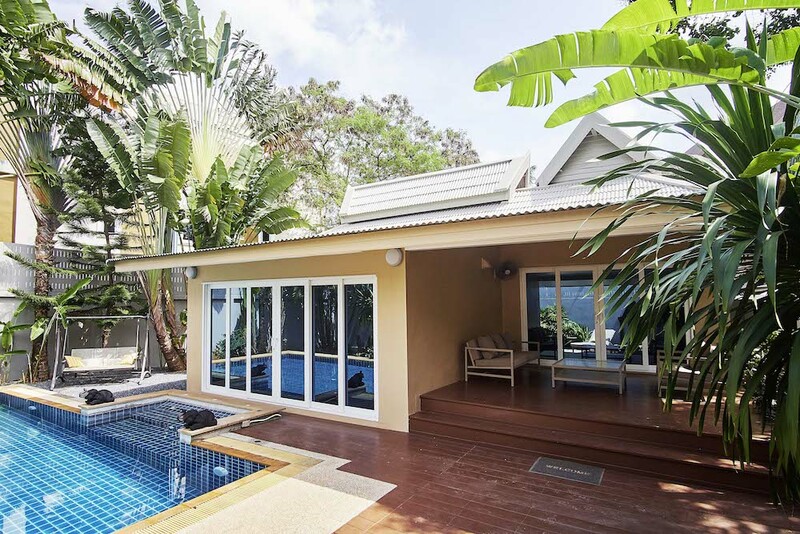 This incredible 580sqm villa is located in vast gardens (3200 sqm) that boast a freeform saltwater swimming pool; a guest bungalow ; and a pétanque ground with bar and barbecue corner – all in addition to the beautiful tropical foliage. 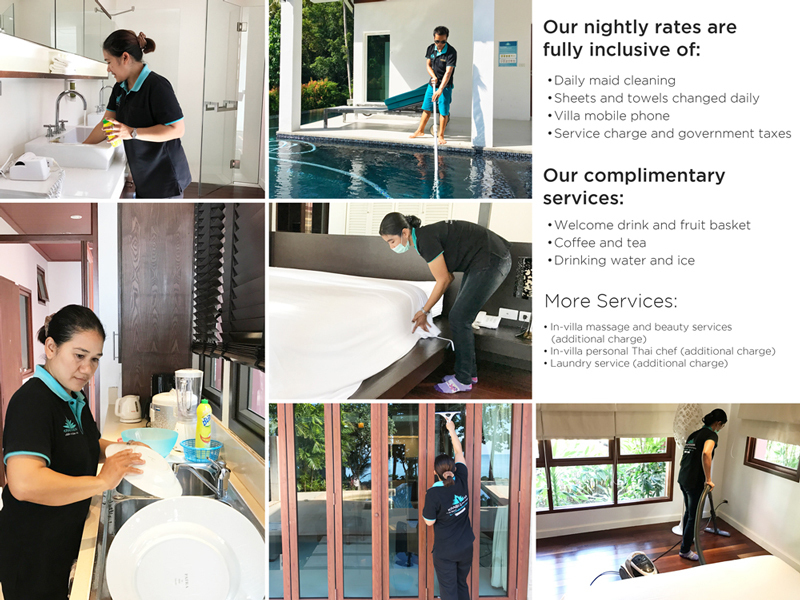 The villa itself has three bedrooms plus a maid’s room; the master suite features a large dressing area and outdoor spa style bathroom. 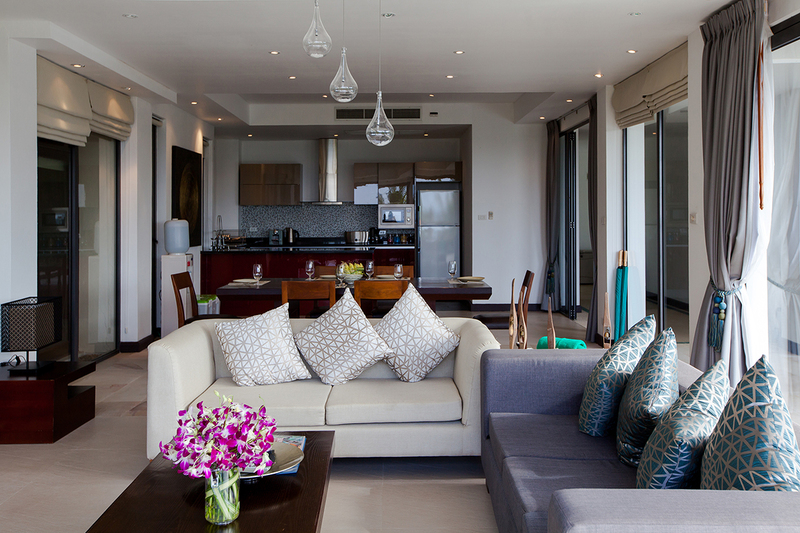 All bedrooms have their own private entrance, but also direct access to the main open plan living space. 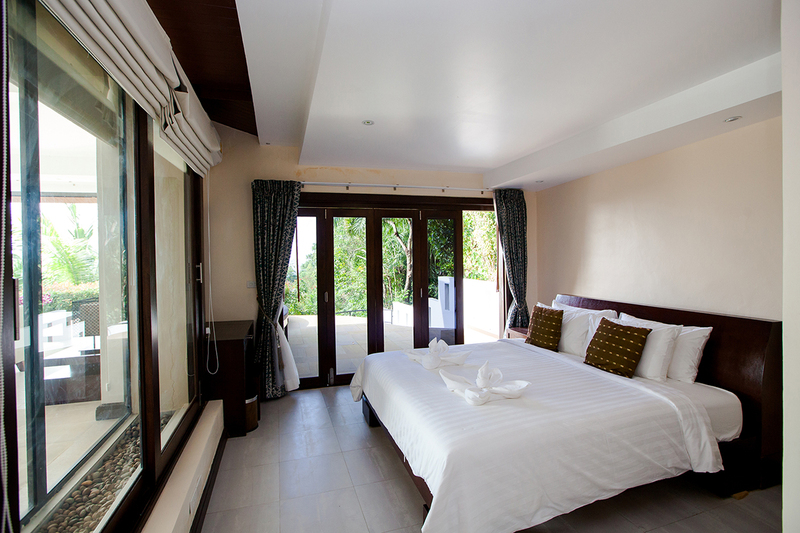 There are four bathrooms in total in the main house; plus another in the one bedroom guest bungalow. Every bedroom has its own LCD television, DVD player and personal safe; and WI-FI internet access is available throughout the property. 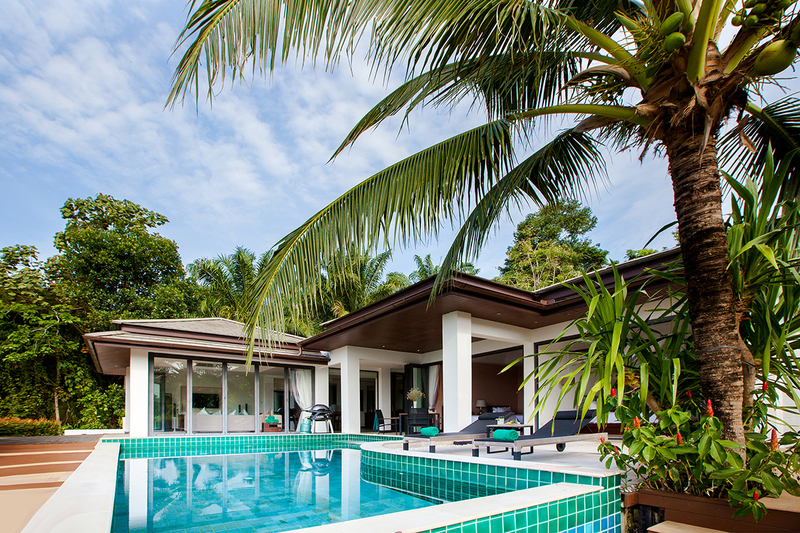 Perfectly secluded behind high walls, Baan ManuChang is a peaceful and private retreat. 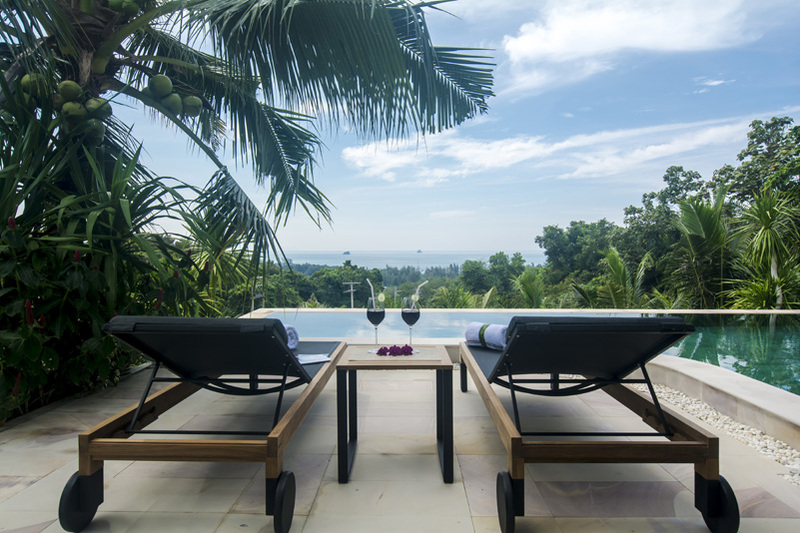 The villa is exquisitely decorated in contemporary Asian style with dark wood and bold accent colours and is surrounded by a pretty tropical garden. 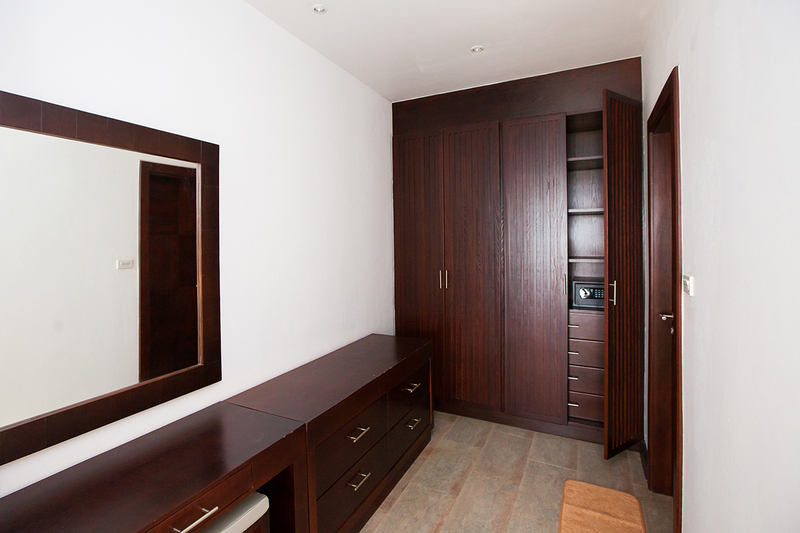 The red master bedroom is decorated with large wood carvings and has a walk-in closet and dressing area as well as en-suite bathroom with rain shower. 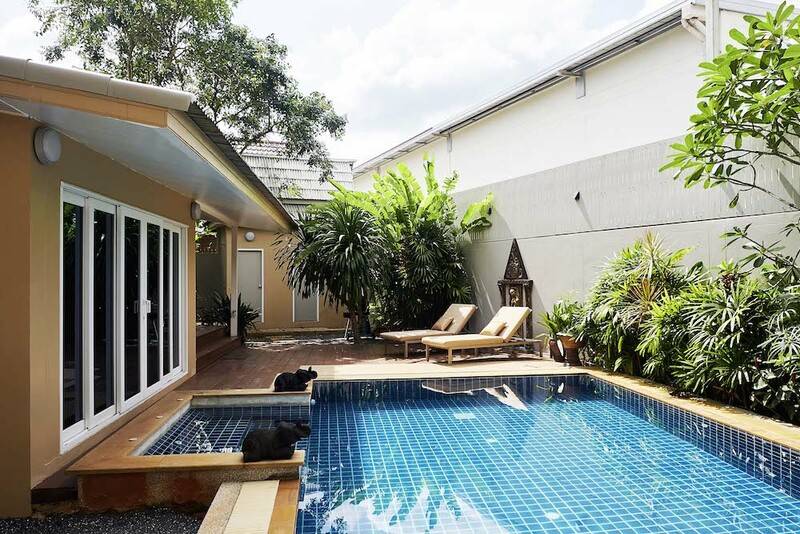 Slightly set back from the pool, French windows open onto a shady terrace; on the other side, sliding doors open down into the light and airy living space. There is a media corner with sofas, one of which can be used as an extra bed; a dining area; and small kitchen, all in dark wood. 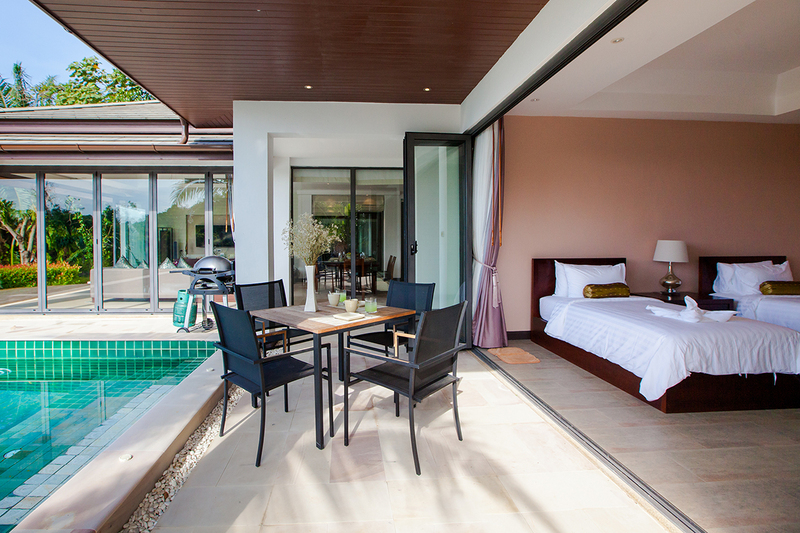 The doors from this room open directly onto the pool, meaning guests can step straight into the Jacuzzi. 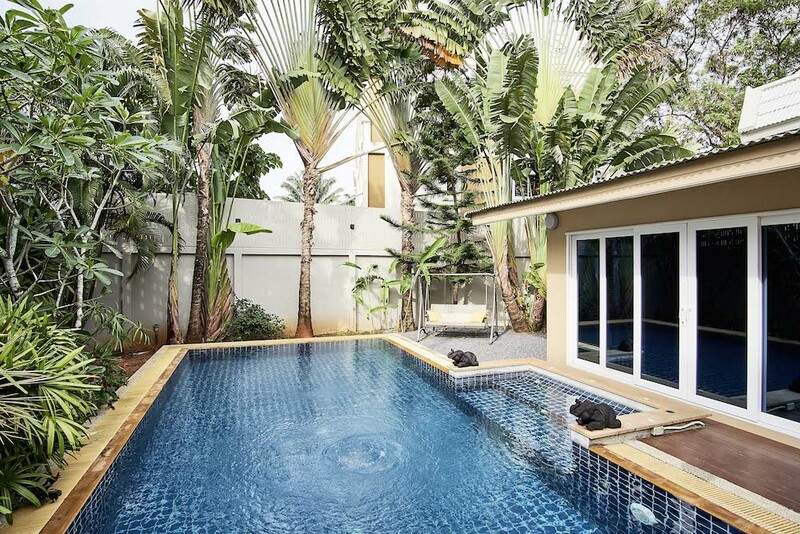 The only sea view villa in our Krabi villa rental portfolio, Baan Breda is a two-storey, 484sqm property, with a 20m length lap pool, set in 1600sqm of well tended gardens. 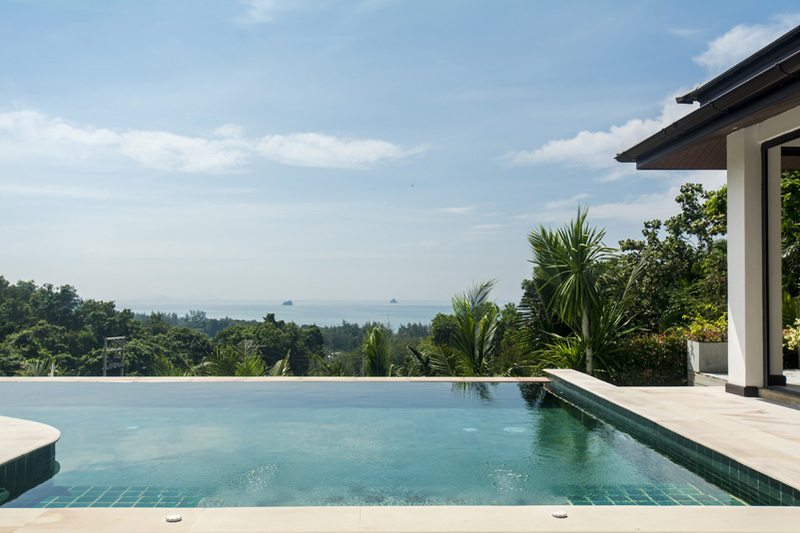 All three bedrooms offer a glimpse of the famous Krabi islands from the balcony; though sadly, even with the Andaman Sea only a few metres away, there is no swimming beach within walking distance. 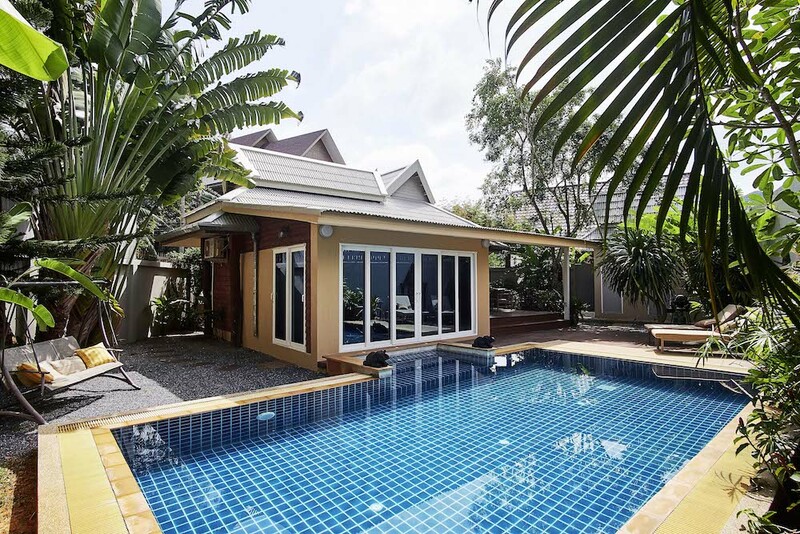 The size of the pool does however allow for proper lengths to be swum, and the varying depth also allows for a substantial play area. 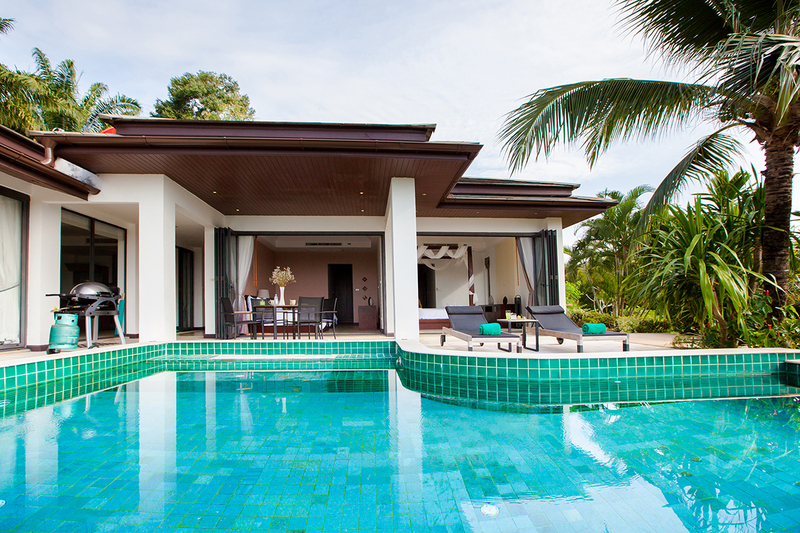 The villa is arranged in an L-shape around the pool area, and is characterized by its modern Thai design and open plan living - dining space. 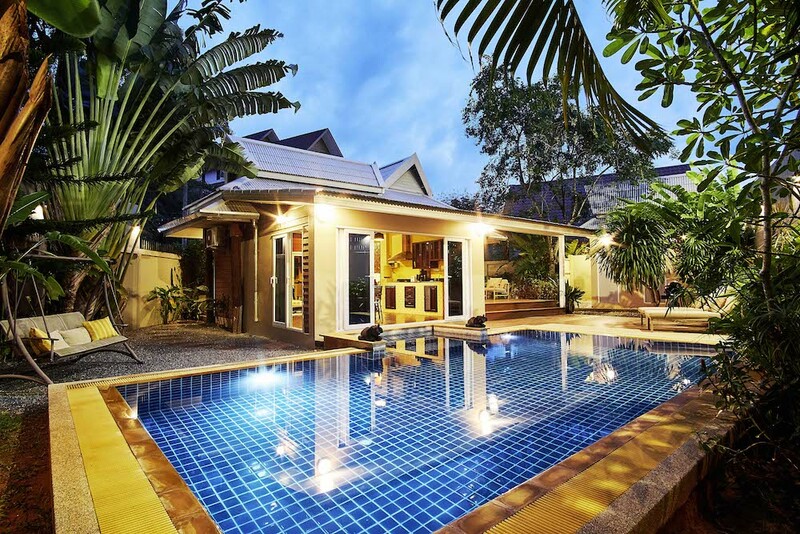 The whole property has broadband wireless internet access.